From weddings to golden anniversaries, reunions and landmark birthdays, Martha’s Vineyard provides the perfect setting in which to celebrate your special event. As one of the top wedding destinations in the United States, you’ll find Martha’s Vineyard’s venues, caterers, party planners, florists, musicians and more who are enthusiastic and able to help you create the event of your dreams. For your guests, Martha’s Vineyard Online is the one stop location for all the information they will need for accommodations, travel to and from Martha’s Vineyard and on-Island transportation options. 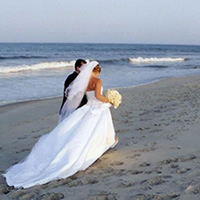 Along with our sister publication, Martha’s Vineyard Island Weddings magazine, MVOL.com is delighted to help you plan your special occasion on Martha’s Vineyard, from simple beachfront ceremonies to lavish formal functions. Martha’s Vineyard not only offers brides the romance of a Vineyard wedding, it’s also one of the most wedding-friendly destinations imaginable. From setting the date to to saying ‘I do,’ MVOL.com outlines what needs to get done and the resources available on MV to help you enjoy the most beautiful wedding possible. Known for beaches, celebrity sightings, and colonial charm, but did you know that Martha’s Vineyard is the second most popular wedding destination in the country? Make Your Stay on Martha’s Vineyard Memorable! Coming to Martha’s Vineyard for a wedding? Let MVOL.com help you to make the most of your brief visit to our beautiful Island.